Martin Brodeur added another shutout of the Pittsburgh Penguins t o his resume' as the Devils defeated Pittsburgh 2-0 in Newark. The Devils will not have much time to celebrate as they travel to Chicago tonight to take one of the West's elite teams in the Black Hawks. Devils goals to Niclas Bergfors (13) and Jamie Langenbrunner (9 empty net). 1) This was a well played and even game. Both teams with 32 shots and only the first period goal by Niclas Bergfors eluded either goalie. Both Brodeur and Pittsburgh backup Brent Johnson were at the top of their game and that made it a fun game to watch. 2) Zach Parise must have gotten under Sidney Crosby's skin in the game as the two stars exchanged words followed by a Crosby slash across Parise's arm. Surprisingly,no penalty was called,but this could have been a call to soothe the Penguins and Crosby,who spent most of the night complaining about penalties to the point that the arbiters once stopped the game to tell Crosby and the Pittsburgh bench to stop whining. 3) David Clarkson left the game in the second period and may have re injured his right leg. Here is hoping that the combative Clarkson didn't come back too soon in a hurry a nd miss more time over the long term. 4) The goal by Bergfors came less than two minutes into the game and on an odd angle from just outside of the right faceoff circle. 5) Bryce Salvador missed the game and will not be with the team in Chicago. Matt Corrente played in his place and Pierre Luc LeBlond was placed on the IR to make place on the roster..
Big news day today as Mike Leach was fired at Texas Tech,the Humanitarian Bowl was (as I guessed) was the most exciting bowl game of the season and the Devils added another win with a 2-0 shutout of the Penguins. However,the biggest news of the day to me was the passing of Steve "Dr Death" Williams,who finally succumbed to his long battle with throat cancer. 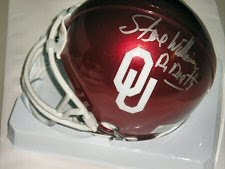 Williams was an all Big 8 guard for Oklahoma along with being a amateur wrestling All American despite not joining the Sooner grapplers until football season was over. Williams finished second in the NCAA tournament to future Olympic gold medalist Bru ce Baumgartner despite the gap in preparation between the two. Many observers of the mat game thought that Williams had he been a full time wrestler might have been able to beat Baumgartner eventually. 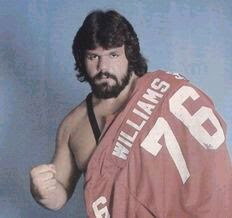 Williams attended training camp with the USFL's New Jersey Generals before entering wrestling with Mid South Wrestling,where he had his most success in the United States before a long run as one of the American stars for All Japan Pro Wrestling. This is a huge loss to me as one of my all time favorites has passed. Look for another post on the wrestling career of Steve Williams sometime next week. P.S-I own the shown helmet and it isnt for sale! Amazingly,the Cleveland Browns won their third game in a row with a 23-9 win over the visiting Oakland Raiders. 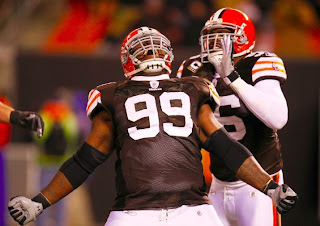 The Browns improve to 4-11 on the season and finish up on Sunday against the traveling Jacksonville Jaguars. 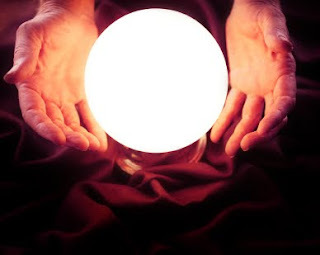 1) The first question that anyone wants to know about is the future of Eric Mangini. My answer is that I don't know. I would say that Mike Holmgren is likely leaning toward replacing him,but a win over the Jaguars would go a long way to helping Mangini's chances. 2) That said,Mangini is going to have a tough time finding another head coaching job anyway with his reputation and may be better served walking away. If Mangini returns,he will likely have a very short hook and an offensive coordinator that will likely be Holmgren's choice not his own. Mangini could be better served leaving now and being able to say that he left due to philosophical differences rather than fired after a bad start in 2010. 3) Considering ALL of that,the names that I am hearing the most as a potential replacement are Steve Mariucci and Marty Mornhinweg. Mariucci is one I could live with as he has success in San Francisco and of all the losing coaching of the Matt Millen era in Detroit,he did the best of the bunch. Mornhinweg is one that I can definitely pass on. His gaffe of winning a overtime coin toss and electing to kick is one that is quite unforgettable and most Lion followers believe that he was overmatched by the job. 4) To the on the field action and 148 more yards for Jerome Harrison,albeit on 39 carries. Still wondering what made Eric Mangini discover Harrison after 13 games,but better late than never.Harrison may not be the long term answer,but he should be able to get the Browns through 2010 and allow the Browns to target other positions to need to upgrade first. 5) Rob Ryan's defense bent but didn't break as the Raiders threatened numerous times,but was only able to come away with three field goals. Three interceptions and four sacks on Charlie Frye were able to offset Frye's 333 yards through the air. David Bowens pick early in the game led to a Browns touchdown,but the biggest one to me was Brandon McDonald's with Oakland down 20-9 and driving deep in Cleveland territory. 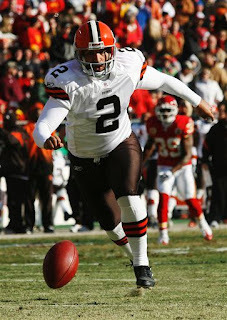 The pick and long return eventually led to the Browns final points off the foot of Phil Dawson and moved the lead to 14 points. 6) Waiver pickup Matt Roth added another sack and assisted on another to p ut into his collection since arriving from Miami. The former Iowa product has shown a knack for not only rushing the passer,but being around the football. Roth might be the type of three down linebacker that the Browns have lacked for years. 7) Derek Anderson wasn't overly flashy in his return to the lineup,but his scoring toss to Mohamed Massaquoi was a thing of beauty. Anderson put just the right amount of air under the ball and allowed Massaquoi to race under the ball and haul it in. It was exactly the type of pass with touch that Anderson has struggled so much with in the last two seasons. 8) This might have been the chippiest game that I have watched this season as both teams seemed to be pushing and shoving on every play and the Raiders were penalized so often that they almost seemed to be wanting to be flagged. On the drive that produced the Anderson to Massaquoi TD,the Raiders handed the Browns 30 yards in personal foul penalties alone and had a player ejected in each half. 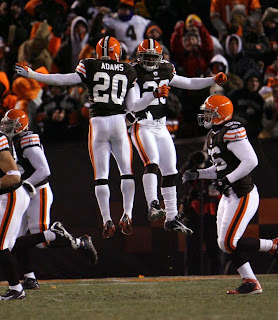 9) Credit to the Browns much maligned secondary as Mike Adams and Eric Wright played very well. 10) If Oakland ever wants to move tight end Zach Miller,I hope Cleveland would be interested. Miller might be the best tight end that I have seen all season. 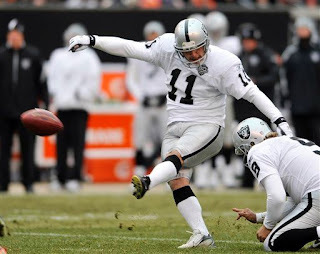 11) And what a bomb off the foot of Sebastian Janikowski at the end of the half. 61 yards isn't the NFL record,but considering the weather and being at sea level,the boot was easily the best kick that I have ever seen. The Devils have split two games since I last wrote about hockey,losing in a listless performance in Washington 4-1 and defeating Atlanta 3-2 at the Rock. So we will look at both games in today's Hell Raisers. New Jersey has back to back games on Wednesday and Thursday as the Devils face Pittsburgh at home and then the Blackhawks in Chicago. 1) David Clarkson returned to action in the win with a bang as he dropped the gloves in the first period. 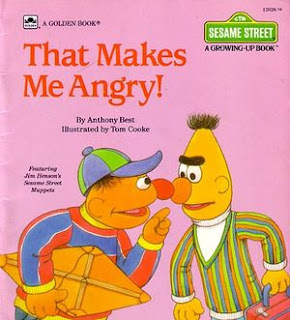 The Devils hadn't had a fight in what seemed like ages and they banged out two in the first period as Andrew Peters fought less than two minutes into the game,earning a game misconduct. 2) Zach Parise was having issues finding the net in December not scoring a goal,but ended that skid with a two goal (16 and 17) night against the Thrashers. The game winner was a thing of beauty off two sizzling passes on the PP from Jamie Langenbrunner and Patrik Elias. 3) Bryce Salvador is questionable after leaving the Atlanta game in the second period with a "lower body injury". The Devils had returned Matt Corrente to Lowell before the game to activate Clarkson,but recalled him to replace Salvador. The Devils finished the game against Atlanta with just five defensemen. 4) Considering the lack of blueline depth in the game,the Devils only allowed one soft goal as Marty Reasoner's flutter puck eluded Marty Brodeur,although Mike Mottau may have gotten a chunk of the puck. 5) Colin White's goal (2) was a pure bullet. White has such a strong shot that I have always wondered why he didnt shoot more and therefore score more. It is not too late,Colin! 6) The Devils loss in Washington was a bad one. Other than Rod Pelley's goal (2),there was very little inspiring about the Devils effort. I wish I could write more,but there isn't much to say besides this-On this night,Washington was easily superior. 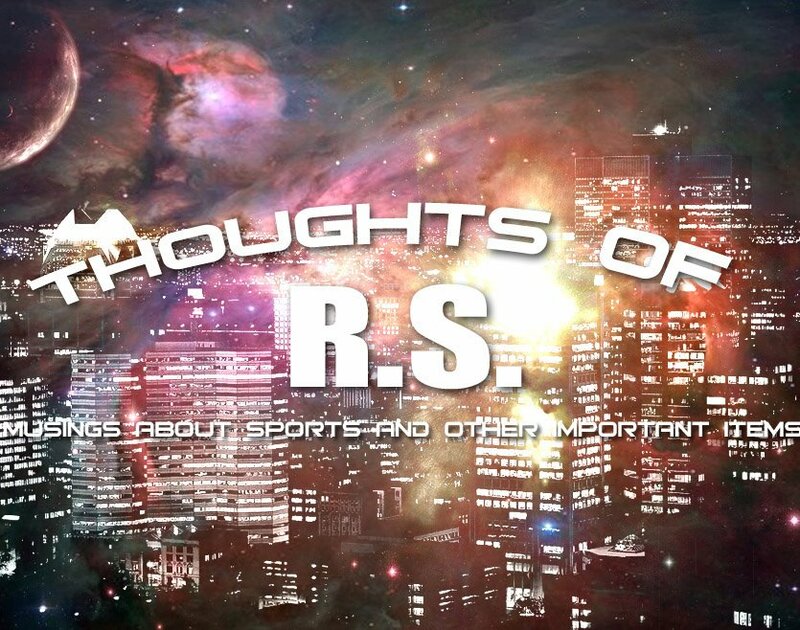 Back tomorrow with a review of the tape and my take on the Mike Leach situation at Texas Tech. Quick Pigskin Picks that includes a mid week bowl game since that will be over before the next Pigskin picks! The Browns host Oakland in another battle of bad teams,yet both are on somewhat of a roll.The Browns have won their last two,while the Raiders have won two of their last three with both wins coming on the road. The funny thing about this is the QB matchup as Charlie Frye and Derek Anderson,who dueled for the starting job in Cleveland face off with each other. I leaned slightly toward Oakland with their superior playmakers,but If Cleveland dedicates itself to the run like they did against the Chiefs (The Raiders are 28th against the run),this could be three in a row. The Packers have to have this one in their last home game. Green Bay controls its own destiny in the playoff run,but doesn't want to be in a spot of having to win in Arizona next week to get in. Seattle is playing out the string. Lots of Aaron Rodgers passes in this one. Game of the week in a week that lacks playoff hopefuls against each other made this a tough call. Sadly,it looks like the best matchup of this type features 8-6 Baltimore against 7-7 Pittsburgh. The Ravens can lock up a playoff spot with a win and some help,the Steelers need to win both their games and hope the royal flush falls their way. Are the Ravens as good as they looked in two wins over bad teams? Beats me and the better question-why do I even care? Can I root for a double disqualification??? Our bowl pick is a game that I bet few of you besides me will watch-Wednesday's Humanitarian bowl in Boise as the Bowling Green Falcons duel with the Idaho Vandals. Idaho gets the home state advantage,but BG has the best player in WR Freddie Barnes,the nations leading pass catcher. If Barnes catches five passes in the game,he sets a new NCAA record for passes caught in a season. Both teams are 7-5,both teams were waxed by Boise State,neither beat a team in a bowl,both score a ton and both give up a ton. If you like wild,high scoring football,you might want to give this a chance! To you and yours enjoy the holiday season! George Michael passed away from cancer today at the age of 70. Most people outside of the Washington area knew George as the host of successful weekend show "The Sports Machine",but locally the area resident were able t o see Michael in his realm. Michael and his NBC affiliate battled Glenn Brenner at the CBS station for local TV dominance at a time when the local sports guy had so much more influence than anyone could have today. Without the internet and ESPN being a far cry from what it has become,the local sportscaster was often your major source of news along with the newspaper of your choice. Michael became the choice over the affable Brenner in our house for one reason-he showed wrestling highlights from the Capital Centre in Washington and Madison Square Garden,allowing the wrestling fan to see endings of matches that we could never see without him. Michael's interest in fringe sports like wrestling,rodeo,NASCAR (can you believe that 25+ years later?) and the odd things like the Skins dirt band (a review of the Redskin game set to music and words describing the game) to catch Brenner and make the monster a two headed one in Washington sports. Michael's interaction with WRC anchor Jim Vance was funny as well. Vance either hated wrestling (or acted like it) in banter with Michael every time that Michael would show wrestling,which made Vance less than popular with the grappling crowd. The irony was that Vance was doing to them exactly what wrestling was doing-working the crowd. Michael was a fan and like most local guys,he was an unabashed rooter of the local teams and it sometimes was over the top,but he was fair on the overall and I have seen far worse as far as bias goes. 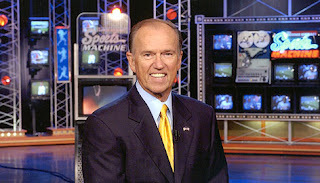 The Sports Machine was ahead of its time with ESPN in its infancy and no one else having the highlights that Michael did made the show a success. As more and more sports channels arrived and technology grew,the show was on borrowed time and finally was brushed aside after losing much of its relevance in 2007. Michael was known for his principles as well. In 2007,WRC (as most local affiliates still are) were cutting jobs to stay under budget. Michael left WRC (with the exception of hosting a Redskins show) instead of firing employees,saving their jobs since he was in a position of not needing the money. His final move was setting up to have his chair filled by Lindsay Czarniak,who became the first female sports anchor in the region. Czarniak is pretty good in the role as well,which shows the eye for talent that George Michael has. Czarniak is good enough to go national,if she desires and is far superior to many that ESPN and Fox Sports uses in those positions. I like to think that I am well informed on politics and I try to keep an open mind on various issues. I consider myself in the middle of the political spectrum and on some issues,I am to the left and others I am capable of agreeing with the far right. All of that out of the way,this health care "reform" really has me boggled. There is so much there to sift through that I feel like a guy digging through sand at the beach looking for a watch! It is times like these that I wish the Bag of Health and Politics was still functioning,they had most of the facts at their disposal and it was their passion to get the information out. Health care is not my passion by any means,although I certainly cannot deny either its importance or the need for reform. From what I can see, I don't see much reform. Unless you think handing big pharmaceutical companies a huge deal and millions of consumers that cannot afford health insurance over to the insurance companies reform. Looking back at the 2008 campaign,we noted that one of the reasons that we preferred Barack Obama to Hillary Clinton was his position on mandating health care. Obama was against a mandatory participation,Clinton was for it. I am against telling people what they have to do in making decisions for themselves,so I oppose mandated anything that deals with how one deals with oneself. But,before I go further,lets allow candidate Obama to talk about this issue in a way that is far clearer than my own. This issue of health insurance comes down to three things-covering anyone that wants to be covered,having the option to participate or not and the fact that many would like it,but just cannot afford it. The proposal on the table satisfies just one of those partitions,insurance companies can no longer turn you down for pre existing conditions and that is a good thing. However,the deal was made with these monoliths that since they have to cover that,they will pick up millions of new customers that will have to purchase their product or pay fines. No choice and people having to buy something they cannot afford. Look at this way-you want a new car,you can afford payments on a car that is sold at 15,000 dollars. Does the government force you to buy a $25,000 car? You cannot afford the payments,but the government makes you buy a car you cannot afford. That is what this plan brings to millions of Americans and from the so called "Liberal" President. Not to mention the cost of the little that we are getting out of this! I can see where there are some people that will be helped immensely by the plan and I am happy for them,but couldn't the same thing been accomplished without mandates? Barack Obama ran on one thing and delivered another. That makes him a typical politician,but didn't he run as being the new type of pol? When you back down (you can call it lie or compromise,your choice) on your first major fight in legislating and go against your own words,doesn't that make you not a man of your word? Sadly,I lean towards the right on this one. I would be all for a government health care plan,but I really believe that on this issue all or nothing is the best swing. The GOP is right on this one and Barack Obama is wrong for compromising his beliefs and words to save political face. Harry Truman attempted to pass Medicare 20 years before Lyndon Johnson got it passed. The good and right things sometimes take time for people to see and realize them. Put the best plan on the table and try to pass it. If it fails,you fought the good fight and history will remember you for being the President with the courage to start the inevitable ball rolling. Instead,it will recall you as the typical pol who put his standing above what was right. 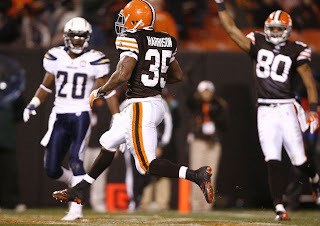 The Cleveland Browns used phenomenal efforts from Jerome Harrison and Josh Cribbs to help the Browns to a 41-34 win over the Kansas City Chiefs at Arrowhead Stadium in Kansas City. The Browns needed every bit of the tremendous afternoons from the pair as the Browns earned their third win of the season. All was not well in the victory,as you will see below,but the Browns improve to 3-11 with their first back to back wins since 2007. 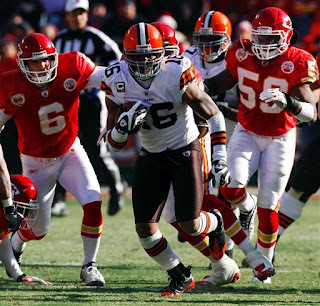 1) Josh Cribbs returned his seventh and eighth kickoff returns for touchdowns in his career in the win. This sets an NFL record for most kickoff returns for TD's in a career and makes Cribbs the best of all time. The thing that sets Cribbs apart from the other great kick returners is the physical,tackle breaking style that he uses. Most of the others (actually I cannot remember anyone like Cribbs) use pure speed and agility and fold at the slightest touch like Deion Sanders. 2) Jerome Harrison rushed for 286 yards on the day (third most in a game ever) after entering the contest with only 301 on the season. Granted the Chief defense isn't the Orange Crush,but still,what a performance. Harrison was the dominant player on the field with three touchdown runs and showed why we have thought that he should have been on the field all along. Now,the big question is,why hasn't Eric Mangini or Romeo Crennel for that matter? 3) Browns fans have given Brady Quinn credit for the Pittsburgh win for "managing the game" despite a meager 90 yards passing because he avoided turning the ball over,but this week against a far inferior defense,Quinn managed just 66 yards and threw two interceptions in Kansas City. The point in slamming Quinn is moot as he injured his foot in the win and will miss the final two games of the season. The real question now is this-Has Quinn shown enough as Mike Holmgren "reviews the tape" to be the Browns QB next season or will a serious challenger be brought in? 4) Derek Anderson starts this week in what will likely be his final chance to impress Holmgren or more likely a possible suitor in the off season. Oakland will start former Brown and Anderson rival Charlie Frye this Sunday. 5) I like the work Rob Ryan has done with the defense all season for the most part,but I just cannot understand how the scheme can protect the talent against better teams,yet bad teams like the Lions and Chiefs have just shredded the Browns. If anyone has an answer,please let me know. 6) Long snappers usually don't get more mention unless they screw up and Ryan Pontibrand did just that this week with a snap off the thigh of the upback. 7) The biggest raspberry of the day goes to punter Reggie Hodges for one of the wimpiest efforts that I have ever seen in pursuing the loose ball on the snap in the end zone. Hodges minced around and allowed the Chiefs to recover for an easy score. Hodges had two choices-kick the ball out of the end zone or jump on the ball. Either option gave Kansas City two points,Hodges instead allowed them seven. 8) Give the Browns offensive line tons of credit for Jerome Harrison's performance,which took Jim Brown out of the Browns record book,but special kudos to fullback Lawrence Vickers,who quietly destroyed the Chiefs as Harrison's lead blocker. 9) I have read some blogs,sites etc that say that these two wins should give Eric Mangini another season. Just look at this win-it took two kick returns for touchdowns and the third greatest rushing day of all time from a player that carried the ball just seven times the week before to beat a three win team by seven points. 10) Just for the record to whoever throws the ball-throwing it to Robert Royal is usually a bad idea. 11) The win put the Browns in either the 4th or 5th draft slot for now,tied with the Chiefs. Had the Browns lost,they would have been in the 2,3 or 4 position as the Buccaneers won their second game last week. A quick look shows these as draft possibilities. St.Louis (1 win) at Arizona,home vs San Francisco. Browns win their last two: No worse than tenth.Buffalo,Chicago,Oakland and Seattle all currently have five wins,so if they all lose out and the Browns win out,the tie breaking mish mosh comes out. One more record for Marty! Martin Brodeur added another record to his list of accomplishments as the New Jersey Devils blanked the Penguins in Pittsburgh 4-0. Brodeur's 35 saves led the Devils along with a three goal second period that tore the Penguins hearts out and silenced the crowd at Mellon Arena. 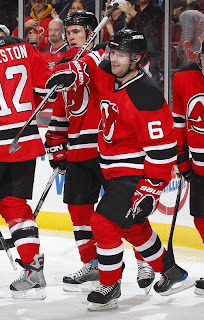 Devils goals to Niclas Bergfors (12 power play),Patrik Elias (8),Mark Fraser (2) and Bryce Salvador (2). New Jersey is off until after Christmas as they visit Washington on Saturday. 1) Martin Brodeur holds all the records that there is to hold-wins,shutouts,games played and three Stanley Cups to boot. Sorry to anyone that disagrees,but Marty is the best. 2) This game was all Devils from beginning to end. Pittsburgh played well in the first period,but after Niclas Bergfors goal seconds into the middle period,the Penguins became sloppy and petulant as shown by Sidney Crosby's slashing of Rob Niedermayer's stick and then shooting it down the ice. Of course,that is a penalty and was called as such. 3) Pittsburgh didn't help themselves in the first period when Bryce Salvador's blast beat Marc-Andre Fleury,but Fleury would have had an excellent chance of making a save had his teammate Sergei Gonchar not screened Fleury's vision on the shot. 4) Zach Parise has not scored a goal in the last ten games,but his effort hasnt dimmed a bit and it showed in Pittsburgh as the left winger assisted on three of the four goals. 5) I know that Dean McAmmond is playing over his head,but he has been so impressive since arriving in Jersey. The guy has such a high motor and never seems to give up on plays. McAmmond might be the most underrated acquisition of the year in the league,although that could be a Devil colored bias there!!! Bonus Round;The win gives the Devils the leagues best record going into the Xmas break and with all the injuries to boot! Kudos to the players,Jacques Lemaire and the coaching staff and of course Lou Lamoriello. After going through a few slow days,there is suddenly tons of things to write about! Health Care is closer than ever to having legislation passed ( and my opinion may surprise you),Mike Holmgren is coming to Cleveland to run the Browns (although maybe not as coach),Martin Brodeur whips Pittsburgh to break Terry Sawchuk's record for career shutouts and the Browns grab another win in Kansas City. Mike Holmgren has agreed to a contract with the Browns to become team president and not as head coach of the Browns. No word on contract terms,but bet on a deal in the five year range and Holmgren banking between seven and ten million dollars a year. 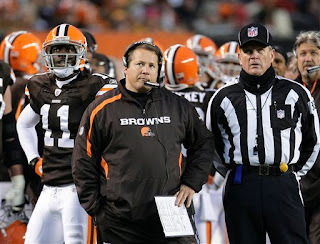 Holmgren has expressed no decision on the future of Eric Mangini,but considering the philosophical differences in each person's system (Mangini runs a basic offense and prefers the 3-4 defense,while Holmgren is a pure West Coast offense guy and likes a 4-3 defense),it is more likely that Mangini will be replaced,but far from a certainty. 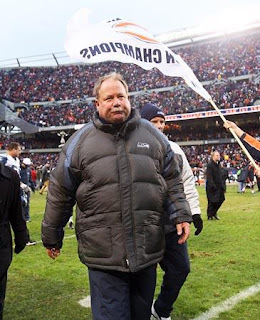 Early yesterday,word was creeping out that Holmgren wanted the head of football operations position and replace Mangini as head coach with himself. This would have been a bad idea as the demands of running the team totally and coaching it are far too high for any person to successfully pull off. A few names to keep in mind as possible replacements if Mangini is canned? Jon Gruden and Steve Mariucci are both tight with Holmgren and could relish an NFL return with a chance to work with their mentor. Brady Quinn could get a final chance to prove his NFL abilities as his style suits the Holmgren way,but his rope likely won't be a long one,but Holmgren likes decent sized backs that can catch the football and his linebackers need to be skilled and be able to flow to the football. Holmgren also likes fast and agile corners and with the arguable exception of Eric Wright,the Browns don't have any of those. Look for linebacker and secondary help to possibly be the first place the Browns look to upgrade in the offseason. For the first time that I can remember,the Cleveland Browns have went out and landed a predominant football mind that has had success at every stop he has ever made and is a proven winner. Mike Holmgren may not succeed,but in any event one must give Randy Lerner credit for a change in attempting to bring in one of the elite and not the first guy that he gets to talk to. Finally,the culture is about to change in Cleveland! The biggest snowstorm to hit December in this town that I can remember knocked the dish off for a good while,so I missed the Devils come from behind win in Atlanta. In the interim before that,the Devs turned a Canadian twin killing with home wins over Montreal and Ottawa. The Devils travel to Pittsburgh tomorrow for a game between the top two teams in the Atlantic Division. Work has called,so I am in and cutting this short. Back tomorrow with some Devils talk and a look at the Browns win in Kansas City! In a far overdue post,here is some thoughts on the Devils dominating 4-1 win from Saturday night over the Philadelphia Flyers. Nicklas Bergfors and Patrik Elias provided the offense with each scoring two goals. Bergfors knocked both of his (10 and 11) on the power play while Elias scored his pair (5 and 6) at even strength. Devils hockey returns tonight hosting Montreal at the Rock. 1) Nicklas Bergfors first goal was impressive to watch as he skated in avoided the Flyer defenseman (Braden Coburn,I think) and then fired the puck through Brian Boucher's pins for the goal. 2) But as pretty as the Bergfors goal was Patrik Elias had one that exceeded that as Elias took a sharp pass from Brian Rolston and lazered it by Boucher. Beautifully done by both players. 3) The pair of goals by Elias allowed the left winger to reach a career milestone with goals 300 and 301. Elias trails only John MacLean as the Devils all time leading goal scorer. 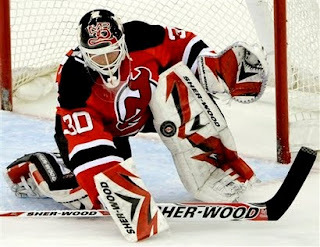 Martin Brodeur's stacking the pads save of Jeff Carter on a DEVIL power play. 5) When the puck drops for tonight's game,Martin Brodeur will tie Patrik Roy's records for most games played at 1.029. Holmgren,Big Ten expansion and more! Mike Holmgren was in Cleveland to discuss the Browns top football job,but couldn't accept it,even if terms were worked out. The NFL's Rooney Rule which says at least one interview must be given to minority candidates. I think the Rooney Rule is a good one,however in some situations it is a waste of time. 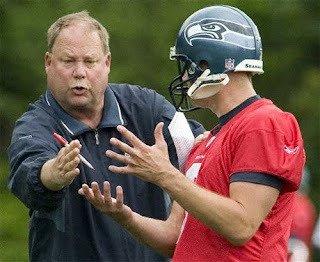 If Mike Holmgren wants this job,it is his,so why bother someone to interview for a job that both sides know will not be offered. My solution would be this one-the NFL could set an experience requirement that if a team hires someone that meets a certain set of experience (therefore being a hire that would be an automatic hire,if the person wants the position),the rule could be waived. For example,take last years Browns opening at coach-Eric Mangini would not have qualified and minority candidates would have to interviewed to comply with the rule,but say Bill Parcells wanted to coach again and interviewed. Parcells coaching resume' would clearly say his qualifications were above and beyond and the Browns could get a waiver in order to get a deal finished ASAP in order to not lose the coach. The Big Ten is talkin' expansion again. I don't like it and feel free to call me a traditionalist fuddy duddy as well. Hell,I don't want expansion,I don't even want to keep Penn State and they have brought some good things to the conference. This is all about two things-the football guys (most notably Penn State's Joe Paterno and Wisconsin AD Barry Alvarez) wanting a conference title game (More money and less downtime before bowl games) and a new market for the Big Ten network. New poll up for your thoughts and look for a post on this when time permits that looks at the pros and cons of each candidate..
During one of the rewatchings of the Browns-Steelers game,I kept laughing at one part. Matt Millen after Pittsburgh's second field goal: "That Mike Tomlin,he's some coach". The first is this-what kind of coach is Tomlin?,Millen didn't say,just that he is "some" coach. The second is how would Matt Millen know? This is the guy that hired Marty Morninweg and Rod Marinelli! Millen used to be a decent color analyst on games,but he might have ruined himself with the Lions GM stint. Too many people (myself included) just think/say this whenever Millen makes a point "How would you know"? Dejan Kovacevic writes in the Post-Gazette that how cruel are the baseball gods to deprive the Pirates of Kyle Drabek,since Doug Drabek was really the Pirates last top ace. It wasn't the baseball gods that deprived the Bucs of Drabek-it was Dave Littlefield. Brad Lincoln has come around and could be a Pirate sometime this season,but look at these pitchers taken in the first round of the 2006 draft AFTER Lincoln. Andrew Miller (6) has been erratic with his control and a disappointment,but still has tons of ability,Clayton Kershaw (7) is a solid big leaguer at just 21,Tim Lincecum (10) Two Cy Young awards already! and Drabek. Hindsight is 20/20 and I admit of all these guys,the one I wanted was the player that has done the least in Miller,but don't blame anyone,but David Littlefield and Ed Creech for particular players not being Pirates. The Pirates named their new team in the Florida State League (boo) the Bradenton Marauders . The logo is Ok and I like the branding of the team similar but not identical to the parent club. All for now,I will either be back later with a Devil wrap from last week or tomorrow with a Devils post covering Saturday's win and tonight game vs Montreal.. 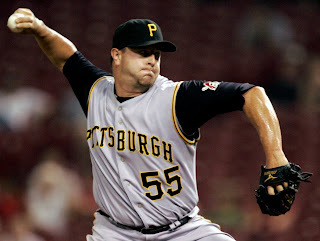 In a surprising move,the Pirates released closer Matt Capps rather than offering him arbitration. Pittsburgh had reportedly been shopping Capps at the recent winter meetings,but gave no indication that releasing him to avoid an arbitration loss was even a remote consideration. This means that the Bucs will enter the season (unless changes are made) with Joel Hanrahan as the closer. If this sounds familiar to you,it might be because Washington tried that last season and Hanrahan was so successful that he became a Pirate. However,Hanrahan does have the arm for the role and his season did improve after moving to the Pirates,so one could see a successful transition for Hanrahan. Capps would have likely won his arbitration case and received a sizable raise despite his worst season as a Pirate. Capps set a career high with 27 saves in 32 save opportunities,but looking beyond that shows that signing Capps to a large deal could have been a mistake. His ERA was over two runs higher (5.80) than his previous high,his WHIP went through the roof and his strikeout to walk ratio plummeted from 7.80 to a lowly 2.71,not good news for a closer that relies on control more than power to get the job done. I can understand this from the Pirates side,they don't want to overpay a possibly declining closer on a bad team when they can spend that money elsewhere. I get that,but couldn't they have gotten something for him? I suppose they were trying,but apparently not hard enough. All and all,I wish Capps could have stayed,but the questions on his decline make me think that this could make sense. The Pirates offered arbitration to Zach Duke and Duke will be the only Pirate entering the system as Pittsburgh signed Ronny Cedeno to a one year contract worth 1.15 million. That means that money shouldn't enter the picture as part of the Cedeno vs Bobby Crosby shortstop as both are on one year deals for similar cash. Pittsburgh also released lefty pitcher Phil Dumatrait to avoid arbitration with him. Not that big of a loss (except to Battlin' Bob,who always liked Dumatrait),but it does leave the Buccos really short in lefty relievers as only Donald Veal remains on the 40 man roster representing the southpaws and I would really like to see Veal with Indianapolis this season..
Will try to be back later with the Devils win over Philadelphia. The New Jersey Devils dropped behind by three goals,cut the margin to a single goal and looked to be on the verge of overwhelming the Florida Panthers on their way to tying the game,only to make a colossal defensive blunder which allowed the Panthers to put the game away in a 4-2 Florida win. 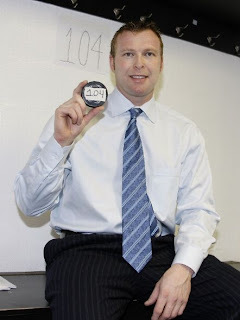 The Devils goals went to Brian Rolston on a pretty rifle shot (11) and Dean McAmmond's first goal as a Devil. 1) We have given Andy Greene tons of accolades,but his mistake last night allowed Florida to put the game away. Greene was pinching in the Florida zone and allowed Michael Frolik to get behind him. Nathan Horton's pass found Frolik one on one with Marty Brodeur. 2) Dean McAmmond's goal came off a pinball like shot that he deflected from the side of the net off the skates of Keith Ballard and by Scott Clemmensen. Nice to see the veteran get off the doughnut in the goal category..
3) Another player that had been playing well that didn't in the loss was Vladimir Zharkov. He missed on a few shots,but his defense was pretty lacking..
4) Patrik Elias usually is sharp on 2 on 1's but tonight,he was too cute and tried to give and go and turned a goal chance into a soft save for Scott Clemmensen. Take the puck to the net,Patrik! 5) Getting frustrated with the lack of 60 minute efforts. Too many "turn on and off" games lately. This team isn't talented enough to do that consistently and it is getting old! The New Jersey Devils continued their winning roll with a 4-2 decision over the visiting Carolina Hurricanes. 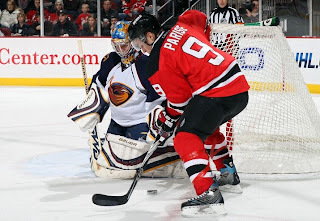 The Devils received goals from Andy Greene (4 and 5 power play).Patrik Elias (4) and Rob Niedermayer (4 empty net). 1) If the NHL had an official Most Improved Player award like the NBA does,the Devils Andy Greene would have a real chance of winning it. Greene has moved from a 7th to 8th defender that played seldomly to easily the team best blueliner this season. 2) Another tale of two games for the Devils-a dominant first period and average play with periods of Carolina control thereafter. If they could be just a bit more consistent,these hold on and pray third periods would go away..
3) Bryce Salvador was hit by Erik Cole and left the game for a while,but did return. Cole was given a two minute penalty for boarding,I didn't think the hit was deliberately dirty,just a bit out of control by Cole. It had to have been as I am far from a fan of Erik Cole! 4) Two assists for Zach Parise and he played well,with five shots on the night. Parise has gotten to the point that he can play well without scoring a goal,which is not always the case with young players. That shows the progression of Parise's game. 5) Pierre Luc LeBlond returns to the team tonight after a two week conditioning assignment to Lowell. No word on his being active for tonight's game. Mike Tomlin vowed to "Unleash hell in December". What he and his Pittsburgh Steelers have produced is a five game losing streak with the last three to three of the worst teams in the NFL. 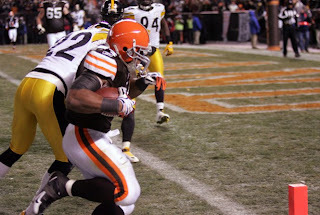 The Cleveland Browns with a defense held together by duck tape and clothes hangers combined a phenomenal game plan to go along with top notch effort and stunned the heavily favored Steelers 13-6. The now 2-11 Browns have 10 days to prepare for their final road game of the season against the Kansas City Chiefs. 1) Eight sacks of Ben Rothlisberger? Most notable of the bunch was Corey Williams bagging two of them. Williams has screamed from the first day he was brought from Green Bay that he was a tackle not an end and wanted a shot at Shaun Rogers position after the injury that ended Rogers season. 2) Give most of the credit to Rob Ryan for the defensive game plan,but give Eric Mangini some credit as well. 3) Jerome Harrison started the game,but Chris Jennings was the main ba ll carrier scoring the games only TD and finishing with 73 yards. Jennings ran hard and might have been a better fit against the Steeler defense. 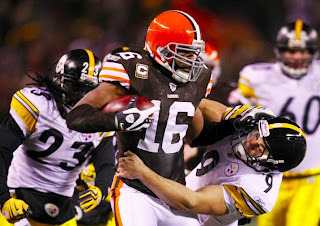 4) But the player of the game on this night was the "Steeler Killer' Josh Cribbs, who always owns Pittsburgh win or lose and his work in the "Wildcat" running and breaking Steeler tackles was the difference on this night. 5) Any idea who Brian Schaefering is and where Lindenwood college (?) is? Well,he was signed eight days ago and finished with four tackles and a sack and a half and looked awfully strong among a dominant defensive line last night. The Cleveland defensive line stomping the Pittsburgh O-Line was a key in keeping the Steelers off balance. 6) Brady Quinn was just 6 for 19 and completed just one pass in the second half,but made no mistakes on a brutally cold night that a mistake could have cost the Browns the game. 7) Another nice game by Eric Wright,who had seven tackles and played a large part in keeping Hines Ward under control (4 catches for 21 yds). 8) The Browns could have an even bigger lead,but Robert Royal dropped a pass that could have been a TD on a drive that was eventually a field goal drive. 9) Note to Steeler fans-have fun with Mike Tomlin,who looked either confused or disinterested as the game went on. Enjoy the feeling of the team not responding to the coach,Browns fans have had that quite often through the year (s). 10) I realize the Browns dropped in the draft with the win and you know what? Usually I like to look at the big picture,but today I am taking the W!!!!! The Pirates officially signed shortstop Bobby Crosby today. Crosby was the 2004 AL Rookie of the Year with a 22 homer output despite hitting just .239. Crosby's power numbers decreased as the average really never improved much,as Crosby has never reached double digit homer numbers since 2004. The former Athletic and son of former Indian Ed Crosby will challenge Ronny Cedeno for the starting position in what should be a battle between "Mediocre shortstops that Ryan hates" for the job. Crosby didn't come at a high cost signing for one season at a million dollars with incentives worth another 500K,assuming he can reach them. A scouting report from our resident Cubs and A's fan,Ryan on the newest Bucco when asked about Crosby's defensive abilities.
" bad defensively,horrible. horrible in ALL ways,his main credential is that he MIGHT be better than Ronny Cedeno.MIGHT". I feel better already and Ryan adds one more cheery note "Look at where he (Crosby) played the most last season. 54 games at first base and only six at shortstop on a team that was playing Cliff Pennington and Adam Kennedy there and now Pittsburgh is counting on him at SS?" Pigskin Picks is early this week with the Browns hosting Pittsburgh in a few hours. Hopes are up in Cleveland with a improved outing against San Diego last week and Pittsburgh having lost four straight games despite the various public mouthings of figurehead coach Mike Tomlin and his "Going to raise hell in December" rantings". All that said,the Browns are going to have to throw the football effectively and often against an ailing yet motivated Steeler defense. Running the ball isn't going to work,Brady Quinn has to have a big night in what looks like bad conditions in Cleveland. Seattle visits Houston in what looks to be a high scoring affair. Look for a good day for Matt Hasselbeck and Matt Schaub through the air,but the Seahawks will need to get some sort of running game from Justin Forsett or Julius Jones to win this one. The game of the week features the Vikings coming off a loss to Arizona against the Bengals,who have won their last two unimpressively against weak teams. Minnesota needs to make Adrian Peterson their centerpiece and Brett Favre's passing the complementary piece instead of the other way around. Cincinnati will need to use Cedric Benson and Larry Johnson and hope to control the game clock.. The Pittsburgh Pirates selected John Raynor with their first round pick in today's Rule V draft. Raynor spent last season at AAA New Orleans hitting .257 with six homers and 36 RBI. Raynor's top skill is his speed,stealing over 40 bases twice in his minor league career. Raynor's numbers were a bit disappointing at New Orleans last season after a solid 2008 with AA Carolina where he hit over .300 and stole 48 bases,but had he continued to put up those types of numbers at AAA,he would not have been available in the draft. Raynor played here in 2007 as a Greensboro Grasshopper and was named the South Atlantic League MVP in that season. 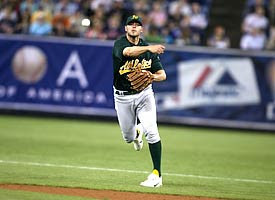 Raynor may be the type of player that could stick for the season as his speed makes him an ideal pinch runner and he is good enough with the glove to be a late inning defensive replacement. Back later with Pigskin picks and a look at the Devils win over Carolina. The Pirates have the second selection in the Rule V Draft and seem to be set to use it. The Yankees have the first pick in the draft having obtained it from Washington in exchange for Brian Bruney earlier in the winter meetings. The Pirates have used their pick in the draft on both of the previous occasions under Neal Huntington selecting Evan Meek and Donald Veal and both were able to stay with the team for the season,Meek through a deal with Tampa and Veal on the roster all season. There are quite a few players in the draft that I would think are worth a shot for the Buccos. Atlanta has two pitchers available of interest in lefty Edgar Osuna and righthander Cole Rohrbough. Osuna would be the safer selection,but Rohrbough has top of the rotation stuff despite some pedestrian numbers and despite the effort to keep him around has the potential to make it worth the Pirates while. EDITOR'S NOTE:Rohrbough is ineligible for the draft. He was in the last class of the now defunct "Draft and Follow" rule and I missed that when looking at rosters. George Kontos of the Yankees almost became a Pirate in the Xavier Nady trade and would be a worth a shot.Kontos has underwent Tommy John surgery and a cursory look might think that would be a liability,but the surgery would enable the Bucs to place him on the disabled list and would actually make it easier to keep him. Yohan Pino of Cleveland seems to be the most likely to help the Pirates right away,but he will be 26 before the season and does not have the upside of the other pitchers mentioned. I wish that I really liked a middle infielder in the draft,but that seems to be the weakest spot and unlikely to be a selection. However,three players have caught my eye position wise and any of the three would be a nice player for Pittsburgh. Cleveland's Matt McBride reestablished himself as a prospect with a solid year split between Kinston and Akron and followed that with a .378,4 homers stint in the Arizona league. McBride can catch,play first and a corner outfield as well. Yankee outfielder Colin Curtis showed surprising power in the AFL and looks like he is just rolling into developing into a prospect. John Raynor of the Marlins struggled at AAA after a terrific AA season in 2008. 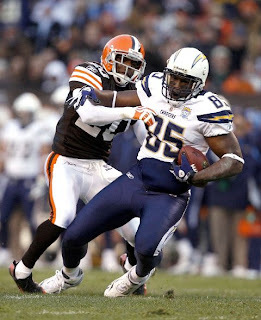 The Cleveland Browns woeful season continued as the Browns dropped a home decision to the San Diego Chargers 30-23. The game was close for a half before a dominant third quarter put the game away for the Chargers. 1) The game was close for the first half (13-7) and the score wound up close,but that can be blamed on one man-Chargers coach Norv Turner. The Chargers moved the ball at will through the air in the second half until Turner began to worry about LaDainian Tomlinson records instead of finishing the Browns off. Add to that,the soft prevent style defense that allowed the Browns three scoring drives in the 4th quarter and that gives you a closer score that the game really was. 2) Brady Quinn was improved and the numbers look nice,but they were inflated by a fourth quarter that San Diego allowed Quinn to play to his strength-short passes. 3) Jerome Harrison finally saw the field and responded with two touchdown catches and over 100 total yards on the afternoon. 4) Tight end Evan Moore was recently added from the Packers practice squad and showed a very nice set of mitts in grabbing six passes for 80 yards in the game. With Steve Heiden out for the season,Moore has a real chance to establish himself as a viable pass catching option at tight end over the rest of the season..
6) Weak plays from the safeties allowed Antonio Gates to just kill the Browns with eight catches for 167 yards. It would have been worse had the Chargers kept throwing in the fourth quarter. 7) C.J. Mosley was placed on the injured reserve list after breaking his ankle in the loss. Former Dolphin and Charger Derrick Robinson was signed to replace Mosley on the defensive line. 8) Moving away from this one and to other topics-I was super impressed with Nebraska defensive tackle Ndamukong Suh in the Huskers upset bid against Texas. Suh could be the top pick in this draft and looks to have the potential to be a dominant defensive tackle that can rush the passer. 9) Another player that I would love to see as a Brown if Suh is unavailable is Tennessee safety Eric Berry. 10) The Steelers will likely win on Thursday,but it sure is nice to see Steeler coach and figurehead Mike Tomlin humbled a bit. The way to "raise hell in December" isn't losing to Oakland at home! We take on the Bowl Championship Series today in Knives and Daggers along with other things that I hate in the college football world. 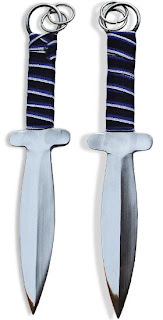 The biggest knife goes to the BCS,which is held up as the greatest way to determine a national champion. Between their Pravda like official site and this winner in where they shoot down any other option to be considered,they completely treat with disdain any other idea. I can understand that,some of them would lose their jobs,but it still is ridiculous. Their claim is that their job is to provide a 1 vs 2 matchup,but the problem becomes when you have to decide who they are. In a year like this where five teams are undefeated,can the title really be settled with one game? Alabama is a given,but the other spot went to Texas for two reasons-Name recognition and Mack Brown (more on that putz later). Normally,the Big 12 is a tough conference and there are lots of name teams there,but this is a really down year for them. Don't believe me?Tell me why the Fiesta Bowl was forced into a position of almost having to take Boise State instead of a second Big 12 team because they didn't qualify a team into the BCS. Another dagger to goes to the BCS for having TCU play Boise State. Granted,their Poinsetta Bowl game last year (17-16 TCU win) was one of the best bowl games of the season,but as good as the game will be and will likely produce the number 2 team in the final rankings,wouldn't you have rather seen each get a chance at a BCS school instead,like Cincinnati is against Florida. Wouldn't the BCS look bad to have TCU hammer Georgia Tech and Boise State crush Iowa and wouldn't the story of the little guy getting their chance been better? The next knife goes to the biggest crying self promoter in Mack Brown. 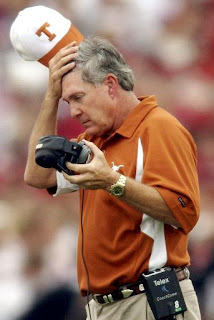 Mack Brown pushes Texas beyond belief for spots in the BCS that classier coaches sit back and get screwed over for. Remember the Aaron Rodgers Cal team that had a BCS spot,then won their final game and yet DROPPED in the BCS standings due to Mack Brown's relentless PR garbage? Click here for exact quotes by Mack Brown and his shameless huckstering. Brown then whined last season when Texas didn't play for the title and Oklahoma did despite UT winning their matchup. What Brown left out was that Texas,Oklahoma and Texas Tech all lost just one game on the season and in conference in their round robin (Texas over Oklahoma,Texas Tech over Texas and Oklahoma over Texas Tech) and it really did come down to the voters. Funny,I don't remember Mack boo hooing as they collected a big Fiesta Bowl check as Texas Tech (who beat them!) collected half of that for a Cotton Bowl berth. And for all of Mack's smack about scheduling,TCU went on the road and beat Clemson and Virginia (UVA isn't very good,but considering when they were scheduled (years ago)-you can see TCU was trying),while Cincinnati traveled to Oregon State and beat a good Beavers team,scheduled Fresno State and a Big Ten team in Illinois. Texas? Well,they went to 6-6 Wyoming and played Central Florida,UTEP and Louisiana Monroe at home. I understand about playing these teams,but wouldn't one tough team be showing some confidence? I haven't even gotten into his crying,bully routine on Saturday's last play against Nebraska. I think the officials got it right,but a skeptic could argue that the Big 12 migh t have lost a sizable amount of bowl money had that second went off the clock and after a last second win over a less than dominant Nebraska team,although watching Ndamukong Suh of the Huskers made me smile thinking of him as a Cleveland Brown-(WOW! ), there was old Mack beating the PR drum. You want to stick it to the BCS? Imagine the controversy then,three undefeated teams and a fourth with one exciting loss to an undefeated team,that makes them look really bad. Our final dagger goes to the people out there that thinks a playoff solves all of these issues. Now a playoff in any format (2 ,4,8 or 16 teams) is far preferable to the current mess,but only if all league champions have bids does anything change and that means a 16 team tournament. An eight team tourney sounds good,until you realize that the BCS automatics take six of the eight right off the bat. In other words,you still have the issues involving the TCU's of the world getting their chance to play for the gold. Marty Brodeur tied Terry Sawchuk's record for career shutouts as the New Jersey Devils blanked the Buffalo Sabres 3-0 in Buffalo. The shutout was number 103 in Brodeur's career and sets the stage for yet another celebration for the netminder after his next shutout,whenever that may be. The Devils scored two first period goals and next looked back as Brian Rolston (10) and Travis Zajc (9) each scored later in the period. Nicklas Bergfors completed the scoring for the night with a second period power play goal (9). Devils hockey returns on Wednesday against Carolina. 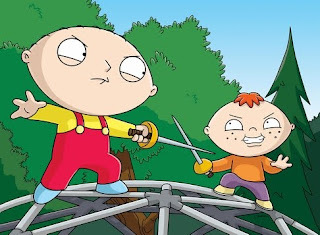 1) I missed the game thanks to the continued kiddies in the sandbox battle between Stewie and Bertram,I mean Direct TV and Comcast. Check out Fire and Ice and/or In Lou We Trust for the view of people that actually watched the game. Back later with some college football talk and more. The New Jersey Devils stormed out early to a two goal lead over visiting Detroit,but a funny thing happened on the way to the usual win when the early lead in accomplished-The Red Wings fought back and forced overtime and the shootout before Patrik Elias put the game 4-3 into the win column for NJ. The Devils goals went to Jamie Langenbrunner (7),Rob Niedermayer (3) and a beautiful goal by the returning Johnny Oduya (1). 2) The Devils sent Matt Halischuk to Lowell before the game. The Devils kept Vladimit Zharkov,which surprised me a little,but the Russian has impressed since his recall and the Devils may have wanted to stay with the hotter hand. Zharkov picked up an assist on Rob Niedermayer's putback goal off a Zharkov shot. 3) The Devils almost played three games in three periods-a terrific first,a decent to good second and an awful third in which Chris Osgood was rarely challenged in net. 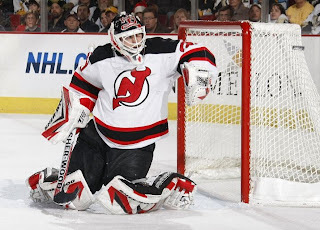 4) But the best news of the third period was Marty Brodeur's play. 5) Colin White did play after being shaken up against the Islanders and played reasonably well. Honestly,I thought all defensemen had decent games in this one. Back later or tomorrow with some rants on the BCS and why I cannot stand Mack Brown! 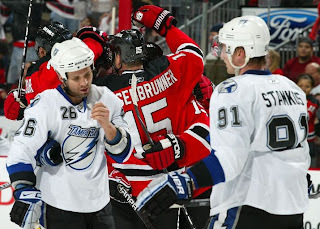 Jamie Langenbrunner redirected a Andy Greene shot by Antero Nittimaki with 38 seconds remaining to lift the New Jersey Devils to a 3-2 win over the Tampa Bay Lightning. The Langenbrunner goal (6) came just over two minutes after a Steve Downie power play goal tied the game for the Lightning. The Devils used the man advantage for their remaining goals from Brian Rolston (9) and Nicklas Bergfors (8). The Devils host Detroit tonight and then have Sunday off before a Monday game against Buffalo. 1) What a bullet off the stick of Brian Rolston for the first Devil goal of the game off the faceoff win by Rob Niedermayer. 2) 30 minutes of ice for Andy Greene,who continues to impress every night on both the offensive and defensive ends. Could the development of Greene (if it continues) mean the Devils suddenly could make a trade involving defensemen later in the season,since the team would suddenly be dealing from a stronger depth position than expected? 3) Speaking of defensemen,Colin White missed the last half of the final period with "lower body soreness". If White is out,it negates the return of Johnny Oduya,which is expected for tonight's game against the Red Wings. 4) Jay Pandolfo and Oduya are both expected to be activated tonight,which means at least one or two players are returning to Lowell. Figure on one being either Matt Corrente or Mark Fraser and the other could be Vladimir Zharkov. 5) Zharkov earned his first NHL point when he assisted on Nicklas Bergfors goal and he has been impressive in his play since his recall. Zharkov could be a contributor to the Devils as soon as later this season,although I wouldn't mind seeing him get a bit more seasoning at Lowell..
6) Both Matt Corrente and Mark Fraser must know that one of the two is headed back as both went all out to impress last night with physical play. Corrente hammered Jamie Wright and fought evenly with Zenon Konopka,while Fraser pounded Ryan Malone after Malone whacked Patrik Elias. 7) The Devils were not exactly firing pucks at the net at will as they shot just 11 times on net in the first two periods. The Browns host the San Diego Chargers with a late start and enter the game even worse than usual with the losses of Jamal Lewis and Shaun Rogers. Consider that and toss in that the Chargers are playing their best football of the season. The Seahawks host San Francisco in a rematch of the game that sent things spiralling out of control for Seattle early in the season. The two teams are separated by just one game in the standings,but Seattle has two of their four wins over the Rams. The Niners have won just one game on the road and Seattle usually beats bad to middlin teams at Qwest Field. The College game of the week is the SEC title game between Florida and Alabama. This one comes down to one thing-Can the Gators keep Mark Ingram from having the big game that allows Bama to control the clock and keep the Florida offense off the field? The NFL game of the week features the undefeated Colts against the blazing hot Tennessee Titans. If this game was in Tennessee,it would be getting so much pub. Can the ailing Colt defense keep Chris Johnson under control and make Vince Young beat them?? HBO features a twin bill tomorrow with two of the most avoided fighters in the wo rld facing off. Paul Williams can fight from 147 to 160 yet cannot get a title bout,while WBC 154 lb titlist Sergio Martinez is struggling with getting top fights even with a belt on the line. The solution for HBO was to match the pair at 160,so Martinez doesn't have to place his title on the line. The matchup sounds nice,but the styles might make this one less than enthralling. The undercard features Chris "Man of a million curse words" Arreola against Battlin Bob's favorite heavyweight Butler Pa's Brian Minto. 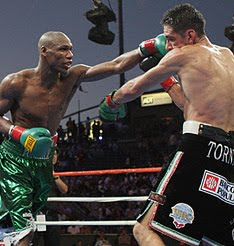 Arreola returns after his one sided loss to Vitali Klitschko and needs the right opponent to make people forget the loss. He has it in Minto,who will stand and slug for as long as it lasts. Have your snacks ready or wait a bit to grab them as this could end early. The Ultimate Fighter finals features Roy "Big Country" Nelson against Brendan Schaub. Schaub has been hyped as a former practice squad member,while Nelson is the former IFL champion,which does not make him champion of our fantasy football league. Looking at these guys,one would never think Nelson would have a chance,but he is the more experienced and more skilled fighter. Plus UFC kingpin Dana White seems to hate Nelson and watching White have to hand Nelson a contract on live TV while choking down his vomit adds to the fun of rooting for Nelson.